The winner of the 55th BT Young Scientist & Technology Exhibition (BTYSTE) has been announced. Adam Kelly, aged 17, a 5th year student from Skerries Community College, in Dublin, has taken home the top prize for his project entitled “Optimizing The Simulation Of General Quantum Circuits“. The coveted prize was presented to the winner this evening in the BT Arena by Minister for Education and Skills, Joe McHugh TD, and Managing Director of BT Ireland, Shay Walsh. Adam presented his project in the Chemical, Physical & Mathematical Sciences section in the Senior category. Adam’s award includes the prize of €7,500 and the BTYSTE perpetual trophy. In addition, Adam will represent Ireland at the European Union Contest for Young Scientists, taking place in Bulgaria in September 2019. Minister for Education and Skills, Joe McHugh TD, said, “I am thrilled to be here at the BT Young Scientist & Technology Exhibition. The atmosphere of excitement, creativity and fun at the RDS this week has been incredible. I am particularly pleased to see so many young people tackling some of the most important issues facing us, from climate change to health, to technology, ethics and societal change. The students are a credit to their families, schools and teachers and they should rightly be proud of being here. They are a huge inspiration. “I’d like to thank everyone involved in the unique and brilliant event that the BTYSTE is; the organisers; the 81 judges; the dedicated teachers; and of course the mothers, fathers and families whose support is absolutely key to this. Shay Walsh, Managing Director, BT Ireland said, “For 55 years the Exhibition has shown the ingenuity of Ireland’s youth, and this year’s Exhibition is no exception. The students at BTYSTE have sought creative and innovative solutions to some of the world’s most pressing issues, and that spirit and drive is to be commended. We say “It Starts Here” at the BTYSTE and it really is only the beginning. From the young students involved in The Primary Science Fair to secondary students at the BT Young Scientist & Technology Exhibition, it is vitally important that every student’s voyage of discovery does not end here. 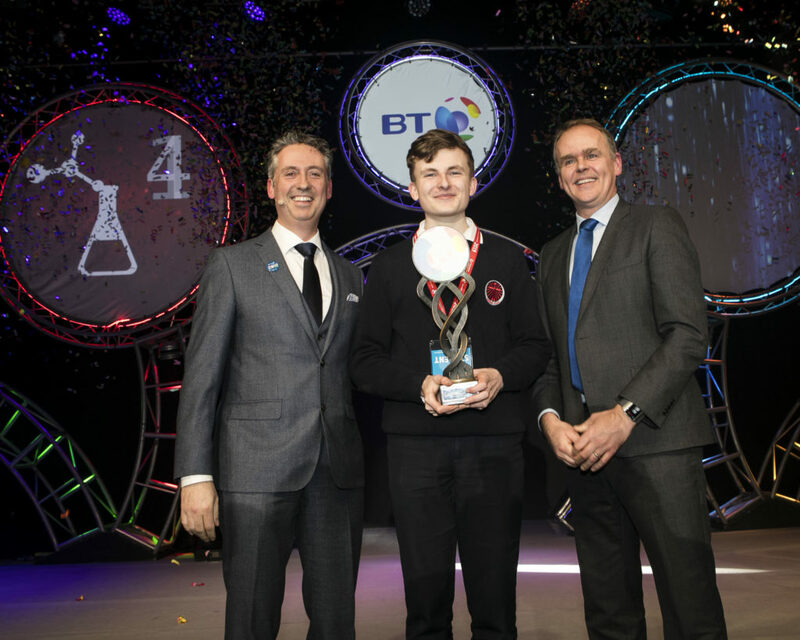 Speaking about the winning entry, BT Young Scientist Judge and Chair of the Chemical, Physical and Mathematics Category, Professor Sean Corish, commented; “Quantum computing is an emerging technology which represents a potentially significant advance in computing. The award for Group winner went to Aoife Morris and Tianha Williams, both aged 16 and transition year students from St Aloysius College Carrigtwohill, Cork for their project entitled ‘Developing an organic solar cell coating solution to mitigate fossil fuels usage by motor vehicles”. The students were in the Chemical, Physical & Mathematical Sciences Category at Intermediate level. This project develops an organic solar cell which can be used to partially power an electric car. The students investigate and characterise different materials for use in the solar cell. Organic solar cells are thinner, more flexible and cheaper than inorganic solar cells. The use of solar cells reduces the need for fossil fuels in the automotive industry and addresses the global environment issue of pollution and climate change. The Individual runner-up award was presented to Yasmin Ryan, aged 16, 5th year student at St Andrew’s College, Dublin for her project entitled ‘Discovery of the Ideal Microenvironment for the Differentiation of hiPSCs into Islets of Langerhans’. Yasmin was in the Biological and Ecological category at Intermediate level. Her project concerns the generation of special cells called stem cells that can be used to generate pancreatic cells for the treatment of Type 1 Diabetes. A new number of proteins called “growth factors” were studied using specialised databases and were identified as candidates that be utilised to allow for the production of stem cells. Her observations have profound potential implications for the long-term treatment of diabetes and cell transplantation. The Group runners-up award was presented to Danila Fedotov and Filip Caric, aged 17 and 18, respectively, 6th year students at North Monastery Secondary School, Cork for their project entitled “A Wearable Device Which Assists Caretakers by Providing them with the Information on the Well-Being of Their Patients”. The students were in the Technology category at Senior level. This project has resulted in the development of a wearable device that monitors the location and status of elderly people with a specific focus on those living with dementia. The prototype is strapped to the upper arm and will communicate with a mobile phone app to allow caregivers to not only constantly monitor the wearers’ well-being, but also to alert in the event of a fall. The number of project entries has almost tripled from 606 in 2000 to an impressive 1,803 in 2019, with entries submitted from across the island of Ireland. 56% of qualified entrants are female, with a significant increase of 62% in the number of girls qualifying in the Chemical, Physical, and Mathematical Sciences category this year. 10% of entries for the 2019 Exhibition are from DEIS schools, a positive indication of the power of this platform to engage participation in the critical STEM subjects. The BT Young Scientist & Technology Exhibition continues tomorrow, Saturday 12th January, and is open to the public from 09:30 a.m. – 17:30 p.m. Make sure to book your tickets online in advance at www.btyoungscientist.com/ticketing to avoid disappointment as tickets have proven once again to be in high demand this year. Visitors can look forward to a packed event once again tomorrow with 20 shows scheduled to thrill all audiences, including the Ministry of Science, Scientific Sue and Space: The Next Frontier in 3D. Follow #BTYSTE and #ItStartsHere to be part of the action!